When my children were in their teens, I used to shuttle them all around town for various before-school and after-school activities. My son would need to get over to the baseball field for practices and games. My daughter was in a performing arts program as a lead actress and would need to get to her rehearsals and performances. Most parents nowadays comment about how busy their children are, and that there is not a moment to spare in their schedules. This was certainly true in the case of my kids. To try and make use of every moment of time, my son and daughter would try to get homework done while in the car. Thus, rather than just looking out the car window to enjoy the surroundings, or rather than idly chatting or maybe calling a friend on their cell phones, they figured that the “quiet” time in the car would be perfect for trying to get some of those math homework problems done or perhaps do some studying for their history or science classes. By doing so, they were aiming to keep from having to stay up until midnight to get their homework done after finishing up all the extracurricular efforts of the afternoon and early evening. In theory, it should have been very doable for them to work on their homework in the car. Unfortunately, it was not always the case. From time to time, one of them or both would succumb to motion sickness. I’m sure you’ve had it happen to you too. For some people, the motion of the car causes them to feel queasy, especially when trying to read or write while the car is moving along. The symptoms and reactions differ by person, and differ by the circumstance. You might feel dizzy. Your stomach might churn. Perhaps vertigo sets in. The worst is a tinge of nausea that then becomes an actual vomit laden outcome. Yuk! This motion sickness is also known as kinetosis. 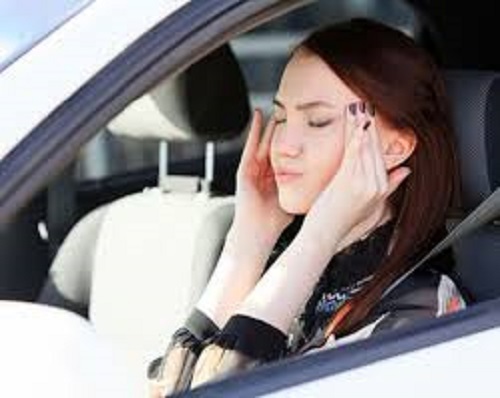 More commonly, some refer to it as car sickness, or travel sickness, and it is similar to seasickness except you are in a car rather than a ship at sea. Remember when people used to frequently get motion sickness while flying in a plane? Today, we still have those airsickness bags at each seat of the plane. Of course, there isn’t much of airsickness happening these days. The earlier era of flying for the general public often had planes that were unable to assure a smooth ride, and the air on the planes was not well controlled, all of which led to a lot of airsickness flyers. That’s pretty much a thing of the past now. Motion sickness in a car is not much discussed today either. That’s because most cars aren’t amenable to doing the kind of reading and writing that I mentioned that my children tried to do. The seats in a car are all facing forward, the space is cramped, and so any kind of serious studying is not really encouraged per se. If we somehow tomorrow made a governmental declaration that you must study while in your car, imagine how much the volume of motion sickness among the population would rise. We’d have an epidemic of car motion sickness! Well, maybe we are headed in that same direction. Not due to a government mandate, but instead due to the new opportunities for being able to study, or read, or sleep, or whatever while in a car. This can all be made possible due to the advent of self-driving cars. If a car does not need a human driver, the prediction is that passengers in cars will begin to use cars for purposes such as reading, writing, sleeping, etc. If that happens, it means that a lot of people that today are not particularly placing themselves into a motion sickness situation, will now be directly immersed in a motion sickness likely circumstance. Suppose you currently drive to work and it’s an hour long commute. Without the need to be the driver, since the self-driving car’s AI is doing the driving for you, what will you do in that car for an hour long commute? Watch a movie? Talk on the phone? Read a book? Catch a nap? I’m betting that any of those actions will increase your odds of experiencing motion sickness. Why would you tend toward motion sickness? There is a lot of debate about what actually causes car-related motion sickness. Drivers of cars don’t seem to get motion sickness, while passengers do. Passengers in the back seat tend to get it more than a passenger that sits next to the driver. Some say that adults get it more than children, while others say that children get it more than adults. Generally, most experts would agree that the mainstay of the issue is that there is a mismatch between what the human is visually perceiving and what their internal bodily organs are telling them. The vestibular system and its sense of movement is often at odds with what the visual system is saying. Let’s unpack that aspect. A driver is looking intently (we hope!) at the roadway and is visually well aware that the car is moving forward. Their internal vestibular system is saying that same thing. Thus, the alignment is good. A passenger in the car that is reading a book would have their visual focus on the book, and therefore not be looking out the window, and would be unlike the car driver. The eyes and visual system of the reading passenger are now at odds with what the internal vestibular system is saying. The internal system is saying that there is rapid forward motion, but the eyes are looking at something that appears to be unmoving. It is believed by many experts that this mismatch is what contributes mightily toward motion sickness while in the car. A passenger seated next to the driver is able to look up and around, and visually realign with what the internal vestibular system is feeling. But a passenger in the back seat has a harder time doing the same thing. Their view of the world is usually blocked by the front seats and other aspects of the interior of the car. They cannot readily convince their visual system that the car is in motion. It is believed that this is why those in the back seats are more prone to motion sickness than the passenger in the front seat. Now, I am sure that some of you are saying that you never get motion sickness in a car. You are probably saying it is hogwash that reading might lead to getting car sickness, because you read full novels all the time while being a passenger in a car. This leads us to another element of car motion sickness. Namely, DNA. Some experts assert that the proneness to car motion sickness might be hereditary. Maybe your genes are such that you don’t get car motion sickness. Meanwhile, maybe other people with different DNA are more prone to it. Some might have DNA that seems to prevent it, some might have DNA that tends towards average chances of car motion sickness, and some might have genes that are very susceptible to car motion sickness. This is one explanation for the variability as to whom gets within its grip. So far, we have the factor of DNA, and we have the factor of the misalignment between your visual system and your vestibular system. Another factor that I’ve not yet explicitly called out, which was hidden somewhat, involves the design of the car itself. Recall that I mentioned that back seat passengers could not readily look around to visually get caught up with the motion of the car. If we could somehow redesign the car so that those back passengers had a more ready visual way to see the car motion, maybe they would be less prone to getting car motion sickness. There are more factors too! Sometimes while in a car, you’ve probably seem someone that was starting to get motion sickness and they rolled down a window to get fresh air. After doing so, they might then say that they avoided going deeply into the motion sickness by having taken gulps of nice clean air. If they were also looking out the window, we might not be sure if it was truly the air or whether it was because they changed their visual attention. I am sure that you though have seen people that adjust the air conditioning in the car and then say that they avoided car motion sickness. In that case, they did not look out the window, and so we might reasonably conclude that the air in the car was a key factor related to their car motion sickness. Let’s go ahead and then say that air and the flow of air might be considered an additional factor for the motion sickness issue. Another factor can be the nature of the motion of the car. When a car is zooming along on an open highway, you tend not to see people getting as car sick. If the car is stuck in stop-and-go traffic, it seems that people tend toward the car motion sickness. On curves, it seems that people tend to get car motion sickness. I remember one time we were driving up to the mountains to go skiing, and the trip up the beautiful mountain in the car was actually a horrible experience because there were lots of switchbacks, steep and sharp curves, and the kids became human vomit comets. I snuck onto the list the factor of age, though as I say the jury is still out about whether adults or children are more or less susceptible of each other. At the Cybernetic Self-Driving Car Institute, we recognize that car motion sickness could be a highly significant detractor from the adoption of self-driving cars, and we are aiming to do something about this before it becomes a huge problem. If the public finds that being in a self-driving car leads to massive amounts of car motion sickness, we doubt that the public will be willing to have or use or buy a self-driving car. They won’t perceive the worthiness of the self-driving capability when all they do is get sick while in the car. Now, you might argue that all people would need to do is pretend that they are driving the car. In essence, they would just need to face forward, look out at the road, and not read, write, or sleep. That solves the problem! Not quite. Though it might be cool to have a self-driving car so that you don’t have to drive, if it also means that you need to sit like a statue and cannot “enjoy” the new freedoms of not having to drive, it will really dampen the acceptance of self-driving cars. I realize some of you are thinking, well, just take a drug. We often see people taking Dramamine or similar anti-motion sickness medications while on a ship or a plane. Suppose we just tell people that travel in self-driving cars that they need to have a large bottle of pills to medicate themselves if they feel car motion sickness coming on. Though I am sure that the drug companies would like this, I am not so sure we want people to regularly be taking those kinds of medications. Imagine if every day during your commute in the morning you medicated, and again when you went home at night. And, you had your kids taking the pills too. We don’t really know what kinds of adverse consequences we might see. The prolonged use and the accumulation of the medications in our systems might produce some bad results. One aspect that we can more readily adjust would be the interior design of the self-driving car. Currently, conventional cars have a steering wheel, pedals, dashboard, and so on. Presumably, with a true Level 5 self-driving car, you don’t need any of that stuff (there is an ongoing debate about this aspect, as to whether even if the human does not need to drive, whether or not the capability to be able drive via controls should be included or not). What should we do then with the interior space of the car if for a self-driving car we don’t need all of the equipment and space devoted to a human driving the car? Some concept versions of future self-driving cars have envisioned that the interior consists of four seats, two that are the front seats but are now facing to the back, and two back seats facing forward. This allows four passengers to face each other, presumably to carry on dialogue and enjoy each other’s company. Other versions of the interior have four seats that all swivel, and therefore each passenger can aim in whatever direction they wish. How much will this lessen the chances of car motion sickness, you might wonder. Aha, some say that it will actually increase the chances of motion sickness. If people are facing backwards in a forward driven self-driving car, their sensory conflict will be worsened. If they can swivel at their own preference, they will make themselves dizzy like in a Mad Tea Cup ride at a theme park. Another aspect of the concept self-driving cars is that they will not have any windows at all. The belief is that people in a self-driving car don’t need windows since the AI is doing the driving. By removing the windows, the passengers will have privacy in their self-driving car. This makes sense for example if you are planning on doing a lot of sleeping while in your self-driving car. You wouldn’t want windows that let people see you asleep, and if you are in your PJ’s then for sure you don’t want them watching you! Aha, once again though this might worsen the car motion sickness potential. No windows, no ability to look outside and get your visual system coordinated with your inner system. No problem, some say, we’ll just put display screens inside the self-driving car. We could even line the entire interior with screens. We could then have the self-driving car cameras display onto those screens. Presumably, you would now “see” that you are in motion. This assumes that looking out a window at the real-world is the same kind of visual result as looking at a projected version of the real-world via cameras. I’d say the jury is out on this for now. Alright, then we’ll use frosted glass. Or maybe have windows but build in special shades that can open or close to allow for privacy within the self-driving car. Indeed, some concept self-driving cars have much larger windows than we have even on conventional cars. Maybe passengers in a self-driving car will want maximum amount of windows, some think. There are some researchers that are using simulated driving environments to try and gauge how people will react to these different kinds of interior designs. They put them into a car simulator and try different aspects. Windows versus no windows. Bursts of air. Twisting seats. Light bars. Screens. Seat vibrations. And so on. Keep in mind that our current design of cars is oriented to the car driver. In other words, the whole premise is that cars are designed for the human driver. You have to have a human driver. You don’t have to have human passengers. With a self-driving car (a true Level 5), you don’t have to have a human driver. You can have human passengers, though that’s not needed per se. Thus, many say that we are mistaken if we don’t redesign the interior of the self-driving. We would be carrying forward a design that no longer is applicable, or at least we could possibly find a more suitable design. Estimates by researchers are that if we don’t redesign car interiors for self-driving cars, we might see around 15-20% of passengers that will be getting car motion sickness. Some say it is less, more like toward 5%, while others say it is higher such as one-third of all passengers. It is hard to say. I think it is safe to say that if we don’t do anything, we are definitely going to have more car motion sickness with self-driving cars. When I make such a statement, I realize you might be asking why does the self-driving car make a difference in this car motion sickness calculation? It is mainly because we now have what were once drivers that now will be passengers, and thus we are increasing the number of passengers in the average car ride, and removing the human driver that otherwise wasn’t getting car motion sickness. And, if you assume that the amount of time we spend in cars is going to go up, since with a self-driving car we can sleep in it and use it all the time, we then are further increasing the chances and frequency of potential car motion sickness. Many are saying that the self-driving car will be our new living rooms. It will be our second living space, while our first living space is our home or apartment. For some people, it could be that they consider their self-driving car as their first living space and they merely “rideshare” a physical place to take a shower or whatever, meanwhile literally living out of their self-driving car. Does the AI of the self-driving car come to play in this? So far, if we only look at the interior design, the AI itself is not playing any particular role. Where the AI does come to play is one of the other crucial factors that was mentioned, the motion of the car. Currently, much of the AI self-driving car capabilities are driving a car like a novice driver. The self-driving car tends to be doing abrupt starts and stops. The AI is not sophisticated enough yet to be able to figure out a smooth drive. We are purposely advancing the self-driving AI to be able to try and achieve a smoother ride, doing so not only for overall comfort of the passengers, but as a way too to help mitigate the chances of car motion sickness. In freeway stop-and-go traffic, you can either drive a car in a staggered fashion, or if you are clever you can get the motion more toward a smoother sensation. That’s what we believe the AI should be able to do. A goal then for the AI is to try and avoid low-frequency motion patterns, for example, and other patterns such as fast and sharp turns, and so on. Should it do this all the time? The AI could do so all of the time, or it could also gauge when to do so. The AI can be observing the traffic situation and judge accordingly whether to invoke the anti-motion sickness driving mode. Furthermore, the AI could ask the passengers if they are feeling a bit of motion sickness, and then go into the anti-motion sickness driving mode. And, if you are willing to go the Big Brother kind of route, suppose the AI has a camera facing to the interior and can look at the faces of the passengers and automatically detect the signs of motion sickness coming on, and then without having to ask the passengers that the AI opts to go ahead and switch into the anti-motion sickness mode. Previous articleCannot add users nor access the File Share Encryption folder. Next articleAccess an #Oracle 11g Database via an #iOS app.